The Journey Continues September 13th -15th , 2019! Save the Date for our 3rd Annual Cedars Ride for Hope and Gratitude in September 2019. We will be in beautiful Bromont Quebec for this amazing weekend! Domaine Chateau Bromont will be our host hotel, set in the picturesque Eastern Townships. With scenic cycling, this year’s ride promises to have great riding camaraderie and some exciting surprises! A unique and epic weekend a waits! Become a part of this incredible weekend! Registration is limited and will close once our room block at the resort is at capacity. To sign-up, follow the easy steps below. 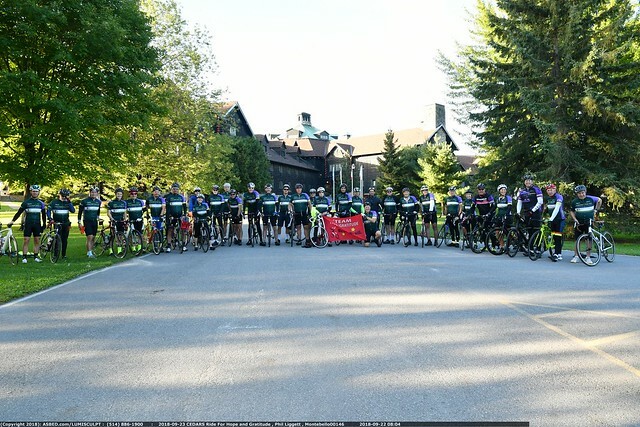 Riders are asked to pay a registration fee by July 01, 2019 which covers most of the weekend activities excluding alcohol and raise a minimum of $1500CDN which goes directly to fund the research of Dr. Laneuville. Family and friends are welcome to enjoy the weekend for an additional fee based on room occupancy. Fabtrends International Inc. Fabtrends International Inc.